The back story is necessary to really understand playwright Lucas Hnath’s witty “A Doll’s House, Part 2, now at Steppenwolf Theatre. Otherwise audiences might sympathize with Hnath’s portrayal of the people Nora left behind when she slammed the door on her conventional, egotistical banker husband and their three children. When Henrik Ibsen, a Norwegian playwright known for digging below society’s conventions to expose them for what they really are, published “A Doll’s House” in1879 he defied accepted familial and economic norms of the day. He shocked a society that placed women in subservient roles to men. In many households, women were expected to be ornamental and needy and they had to have their husband’s or father’s signatures and OKs on legal documents. 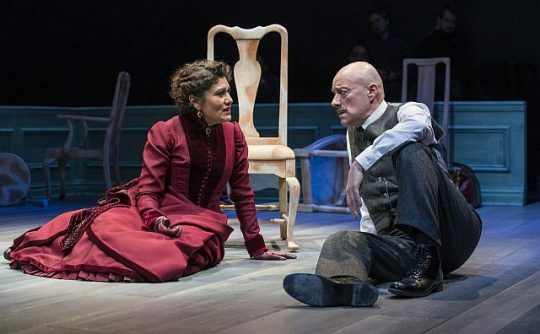 Hnath, adept at penning plays that are both comedic and tense, (think Isaac’s Eye), takes on the “Doll’s House” iconic feminist heroine to ask how did she fare 15 years after she left her husband Torvald’s household and his demeaning view of her so she could be free to define herself. Portrayed with gumption and defiance by Steppenwolf ensemble member Sandra Marquez, an extravagantly clothed Nora first challenges her old nanny, Anne Marie, to guess why she looks rich.